eBookings Manager™ comes complete with our free web-based back office suite that enables you to maintain one or multiple sites, users, access rights, configuration and a full reporting suite for analytics. Alternatively, we can maintain your system on your behalf for a small nominal additional fee. Our Manager’s Dashboard is provided free of charge and gives you total control over availability management and table inventory. eBookings Manager™ is genuinely real-time – not an e-mail enquiry! We provide restaurants with a state-of-the art Electronic Reservation System which allows you to conveniently make instant reservations 24/7. When booking with eBookings Manager™ we connect directly into the restaurants to check real-time availability. The booking is immediately recorded in your restaurants Reservation System and your guest receives an instant Booking Confirmation by e-mail. It is that simple….just like booking a hotel or an airline. 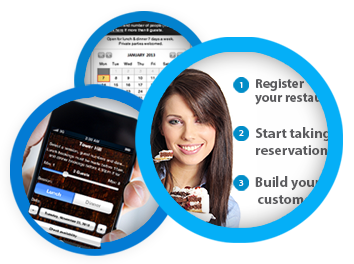 Diners can make table booking reservations via the Web without any fear of overbooking or overloading a restaurant at any time. eBookings Manager™ notifies you immediately when new reservations are made so you are constantly up-to-date. Web reservations & telephone bookings can be seamlessly managed from one single application. eBookings Manager™ is flexible enough to work for every type of establishment from small individual restaurants through to large chains with multiple brands. No hardware or software installation is required. There are no setup fees or monthly fixed costs for the restaurant. All features of the web bookings interface are easily modifiable by the restaurants themselves. This additional module enables you to map your tables to the inventory that you release for web reservations. Enables you to manage tables, table groups, booking areas, etc. The Table Manager Dashboard enables you to seamlessly manage your web-bookings, together with telephone bookings and walk-in. Manages all your customer data and fully integrated with Web bookings, telephone bookings and eSurvey Manager.